The WA Vets Will Clinic, a nonprofit clinic that serves veterans of Washington are providing estate planning documents at no cost to veterans across the state during the month of October. There are five clinic locations statewide during the month of October. The Clinic in Seattle will be held on Saturday October 24th from 9am-4pm at the University of Washington School of Law. Free parking is available for all veterans. Registration for the 2015 Clinic is open at http://www.wavetswillclinic.com/sign-up (full details and disclaimers on the website). Attorneys will use the online registration to prepare draft documents. The veteran will then be scheduled for a one-hour meeting with an attorney on Saturday, October 24. Changes to the documents will be made on-site. The documents are printed, signed and notarized at the clinic. The veteran walks out with a complete set of documents at no cost. To obtain these documents privately, the average cost is $500-$1000. The majority of Washingtonians do not have estate planning documents so the clinic provides a much needed resource. Veterans of any military branch can receive a free set of estate planning documents (a will, advance health care directive and power of attorney) on Saturday, October 24 from the Washington Veterans Will Clinic. To qualify, the veteran needs discharge papers (DD 214), proof of Washington residency and assets less than $500k ($1 mil if married; spouses are included at the clinic). Please pass the word to any veterans you know about this great resource. For further information or questions, please contact the North Sound clinic at seattle@wavetswillclinic.com or 425-610-6355. In June, the U.S. Department of Veterans Affairs (VA) reversed a longstanding position and extended medical benefits to about 2,000 Air Force reservists who worked on C-123 aircraft that were returned to the United States after being used to spray Agent Orange defoliant in Vietnam. The VA was acting on findings of an Institute of Medicine ad hoc panel, whose seven members included John Kissel, a University of Washington professor of environmental and occupational health sciences. In an interview, he gave context to the panel’s job, its process and findings, and his takeaway. This Q&A is excerpted from that conversation. Q: What’s your background that led to your inclusion on the panel? A: I do human exposure assessment in community and occupational environments. Q: What was the panel’s task? A: We were supposed to decide whether the Air Force reservists who flew and maintained the planes well after Vietnam could have gotten meaningful exposures to Agent Orange residues that would make them potentially eligible for compensation. John Kissel is a professor of environmental and occupational health sciences. Years ago Congress decided that, presumptively, all Vietnam veterans were exposed to Agent Orange and its contaminant, dioxin. The standing IOM committee on Agent Orange – another group, not our panel – has reviewed epidemiological records and created a list of health outcomes for which there is an accepted link between Agent Orange exposure and negative consequences. I think 18 or 19 diseases are on the list. We were looking at a population of people who didn’t go to Vietnam but who may have had equal or higher exposures than some veterans who did. The non-Vietnam veterans were presumptively not covered. Q: Was the panel going to stand entirely on science, either way, or were you looking for justification to cover the reservists? A: We had one public hearing where people were able to offer their opinion. There were advocates for the reservists and on the other side there was the VA’s primary consultant as well as consultants paid by Dow and Monsanto, who made Agent Orange, to argue that the reservists’ claims didn’t hold up to scrutiny. We also received written comments on both sides of the issue. Q: What did the science tell you? A: We had a problem with lack of information. If you want to assess a person’s or a group’s exposure, you would like to have environmental data from the period of exposure, plus skin data, inhalation data, and urine data from the population. You’d also want to know the length of potential exposure – how many hours a day, how many years. At the individual level, we had little or none of that. What we had was residue numbers obtained from the planes a decade or more after the reservists served. Given that there was still residue in the planes 10 or more years after they had been active, we were confident that there was residue in the planes when the reservists were working. Q: The dioxin residue was still there? A: A lot of military aircraft get mothballed in the Arizona desert because things rust slowly. The planes’ doors and windows were sealed up. Dioxin biodegrades very slowly and, if there’s no sunlight, it can’t decompose through photolysis. 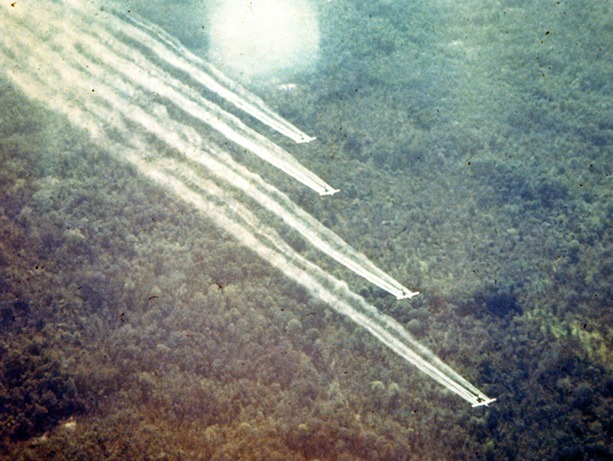 Dioxin residue was found in aircraft used to spray Agent Orange defoliant in Vietnam. Q: Your panel’s report didn’t actually recommend coverage for the reservists. A: It wasn’t ours to decide whether to compensate the reservists. We were asked to answer whether meaningful exposures were plausible. We estimated that the reservists would have been “downhill” in a chemical sense from the surface residues, so exposures would be expected. We also determined that, given the paucity of information, we could not conclude that the reservists’ exposures would have been negligible. We decided that to go to just that far, and left it to the VA to make the final decision. Q: What do you take from this experience? A: It’s enjoyable to serve on a panel with bright people to chew on a real problem, and there’s satisfaction in writing a report that somebody read and that apparently made a difference. That doesn’t always happen.